It’s my fault that I got tongue tied and didn’t explain myself well last night. I’m actually on the opposite side on the Iran question from many people I otherwise agree with. I think attacking could be a disaster for the US and am worried that Obama will do it, for fear of seeming weak before an election. Of course the Iranian government is awful and deserves to be crushed. But I’m not persuaded we or Israel could do it in a way that doesn’t cause even greater problems. That’s the main lesson of Iraq it seems to me. See, the problem with declaring war on Iran is that it would be a “disaster” … for the US. It might cause problems. That’s the main lesson of Iraq. You could argue that this position is less monstrous than the one that tongue-tied Tucker seemed to profess on Fox News. After all, he’s saying that we shouldn’t take actions that would lead to the senseless slaughter of thousands of Iranians. But he’s doing so while also making clear that the lives of those thousands of Iranians are not the main issue. National interest, dammit! If the “main lesson” of Iraq was really that one should refrain from committing inexpedient atrocities, then no one’s really learned anything. Just remember Tucker’s words the next time he castigates the Iranian government for how poorly they treat Iranians. In layman’s terms: during the peak tourism months in Florida (when the demand for cheap labor rises to accommodate the influx of tourists), the state is more likely to penalize welfare recipients — for whatever reason — by withholding funds. Thereby, presumably, forcing them to find employment in seasonal, minimum wage jobs. Still, this is nonetheless pretty persuasive evidence that case workers do, in fact, calibrate sanction levels to the needs of the job market. So my next question is this: is this a bad thing? Mike doesn’t really take a position, though he seems vaguely disapproving. And it’s possible that the details of the sanctioning regime are objectionable. But just in general, is there anything wrong with welfare case workers trying to push clients into the job market when jobs are available, but being more lenient when jobs just aren’t there? Offhand, I’m not sure I see a problem with this. Drum misses a few things. I say this with a nagging sensation in the back of my mind that by co-signing this I am in some way revealing myself to be intellectually or morally lacking; but I feel deeply ambivalent about devoting my political energies to battling-back American empire. And it’s for entirely fatalist reasons. It seems sadly inevitable to me, at least for the foreseeable future and until the United Nations or some other form of global governance becomes supreme, that the world will be run by at least one Great Power. That’s not to say I’d not rather it was otherwise; but rather it is to say that I feel my passion, time, and capacity is finite. I wouldn’t for anything wish that those who have devoted themselves to challenging, exposing, and attacking the American imperium stop. I just can’t honestly say that this goal moves me as much as does the cause of economic and social justice. Just as I often find the ideologies of leftist anarcho-syndicalism deeply appealing — but determine that, pipe dreams being what they are, I’d rather work for a more accountable Big Government — I hope for a more transparent and accountable neo-empire. I’m not discounting the idea that an accountable empire is no less a fantasy than rolling back empire entirely. I’m merely sharing my gut feelings, and an explanation as to why I find Ron Paul’s appeal utterly minuscule when compared to his defects. As colossal and entrenched as American empire may be, making it “accountable” is far more of a pipe dream than rolling it back. There is simply no way to address the root issues Elias wants ameliorated without eventually confronting the militarized structures that perpetuate existing conditions. If you believe otherwise, ask yourself who profits from America’s wars, and who is asked to fight them. Ask yourself what impact the justifications for military expansion have on domestic law enforcement, and who suffers the most from the results. Ask yourself why laws ostensibly designed to aid in the war on terror are being used to fight the war on drugs. Ask yourself again who pays the price. As long as the progresssive movement continues its myopic obsession with dividing its concerns into hermetically sealed categories like “civil liberties issues” and “economic issues,” it won’t have the conceptual equipment to deal with structural ills. A political coalition needs an analysis; what progressives have now is a policy wishlist that adds up to exactly the sum of its parts. Maybe figuring out how those desired policies interrelate should be a bigger priority than bickering over the rankings. Posting will be light-to-nonexistent until Sunday or Monday, as I’m taking some time off in New York City, visiting friends and doing my best to avoid large parades. If you’re in the city and you want to grab a drink, hit me up. What I’m thankful for isn’t the subject for just one short blog post, but I will say that I’m thankful for your continued indulgence as I return again and again to writing about the topics that mystify me the most. And I’m especially grateful for those of you whose insightful comments have made me slightly less mystified. And lastly, I’m grateful for The Onion’s Turkey Day-themed humor. Thanks to Dara for pointing out a copy of Obama’s flowchart on the topic. I’m half-seriously thinking about critically analyzing it in a blog post. A 2009 study by Carlsmith and Sood delves into the motivations behind support for harsh interrogation techniques. They discovered that support levels for harsh interrogation techniques did not really correlate with conceptions of the efficacy of the techniques themselves. It strikes me that there’s another dimension to this as well, though. I don’t have the research to back this up — though hopefully Carlsmith and Sood, or others, might do some further studying — but the people I’ve encountered who defend America’s torture regime either deny the amount of pain inflicted or categorically refuse to classify it as “torture,” or both. There’s also a distinct separation and depersonalization at work here, not just with regard to the detainees, but also to the torturers themselves. For all the talk about “giving the military the authority to do what they have to do,” and so on, we lose the main point about whose responsibility this is: ours. This is still a republic, and if we sanction members of our government to torture others without legal consequences, then the onus falls on us. I think this changes the context of the debate significantly. Defenders of torture are willing to stand alongside authority figures who, presumably in the interests of their safety, commit unspeakable acts. But are these defenders willing to assume responsibility for the acts themselves? The less we allow them to hide behind abstraction, the better. Apropos of yesterday’s post about how Westernization can sometimes be conflated with modernization, there was a piece up at Good a couple of days ago arguing that developing countries would be ill-advised to adopt America’s culture of ownership. As the East develops, and the size of the middle class grows, there is a push toward individual ownership. With increased incomes, the incidence of joint families reduces, and sharing resources is less of a financial necessity. However, if the East starts to choose individual ownership more readily over communal access, emerging economies will likely struggle to manage these patterns of consumption, particularly with regard to pollution and waste. From an economic development perspective, Western practitioners are guilty of seeking solutions for the poor that are based on these American values. It’s only natural; this ideal is integral to the West’s notion of progress. Solutions to a lack of access to clean water, sanitation, healthcare, and education often cater to the provision of individual ownership: a faucet in every kitchen, a toilet in every home. However, this paradigm is wasteful, and thus, may not be ideal or sustainable for developing world countries. Of course, as the article points out, this cuts both ways: the United States has been practicing an unsustainable level of consumption for awhile now. Luckily, the collaborative nature of the Internet has engendered some positive trends on that front. To me, this isn’t just a matter of allocating resources responsibly: there’s a political and (self-parody alert) philosophical dimension. Pooled resources and communal interdependence are naturally going to foster more of a community-minded spirit. On the other hand, our culture’s over-emphasis on individual ownership has created* an illusory sense of independence. Instead of depending on our neighbors, we’ve just wound up depending on bigger, more abstract forces. And sure, we’re never going to be wholly not dependent on those things. But these aren’t forces that one can necessarily feel a sense of collective responsibility towards, and that sense of collective responsibility is an important and (in the here and now) hugely undervalued ingredient in the glue we use to build nations. *And/or been caused by, but let’s stay away from the chicken/egg implications for now. 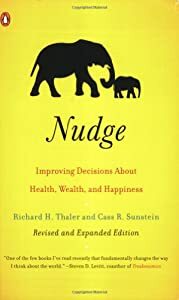 Recently I had the opportunity to read about half of Richard Thaler and Cass Sunstein’s famous book Nudge. It was more or less what I expected: a broad overview of different observations about human behavior from the young field of behavior economics, followed by a series of arguments for various policies that utilize those behaviors in a constructive way. The biggest surprise of the book — given Cass Sunstein’s reputation as a “non-ideological pragmatist” and his current employer’s reputation as same — was how willing Thaler and Sunstein were to engage with the philosophical arguments for and against their doctrine of libertarian paternalism. Burke was cited, as was Rawls. As for libertarian paternalism, and nudging itself, I’m basically onboard. I’ve argued before that public policy can’t help but influence social norms, and so policy makers need to think about how to influence them in a productive manner; this book provides a handy conceptual framework in which to do that. It goes without saying that the concept has limited utility (Sunstein’s proposals for how we can nudge conspiracy theorists are kind of disturbing), but it also adds some much-needed texture to notions about what constitutes good policy.